Since coming back from an injury, David Price has had an unsettling strikeout to walk ratio (24 to 14) accompanied by 16 earned runs in a mere 28 innings of work. Last night against the explosive offense of Astros, out of the first 14 batters Price faced, eight of them reached based including 2 walks and a hit by pitch. Price has been battling a blister on his left ring finger for several weeks now. This blister prevented him from throwing in the bullpen between his start at Yankee Stadium and against the Phillies last week. 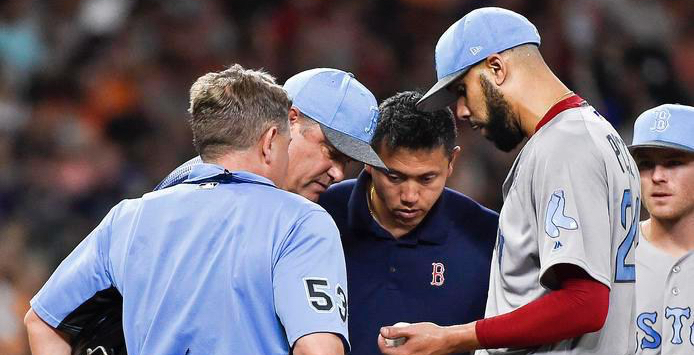 In the bottom of the third, manager John Farrell and head trainer Brad Pearson visited Price on the mound to check the blister, but he stayed in the game only because it was on his ring finger. The only pitch it would effect would be the change-up. Evidently, the blister changed the game plan as Price threw more than twice as many curveballs than change-ups. He threw 20 curveballs last night, which is six more than he has thrown in the last two games combined. Out of the eight change-ups he did throw six of them missed the plate. With Price not being able to rely on his most effective pitch, his change-up, he was limited to only his curveball and array of four fastballs. It wasn’t until the fifth inning when Astros hitters picked up this new game-plan being able to gear up for the fastball. Carlos Correa hit a homer that left in a hurry in the bottom of the fifth to give the Astros a 2-1 lead. Followed by a moonshot onto the train tracks of Minute Maid Park by centerfielder Jake Marisnick in the sixth ending Price’s night. Xander Bogaerts supplied some much needed power to the Sox lineup completing his first career multi-home run game with a two-run shot in the sixth to give them the lead 3-2. Going into last night’s game, the Red Sox bullpen had a 25 1/3 consecutive scoreless inning streak. The streak was ended shortly after Heath Hembree entered the game making his 31st appearance of the season. Then with one mighty swing of the bat, George Springer crushed his 19th of the season high of the the Champion Energy Services sign in left-center field. Now with Matt Barnes on the hill in the eighth, the Astros were trying to claw back as with a bloop single into shallow left field. Springer was scoring as Altuve, the tying run, was rounding third. Little did he know, Benintendi was rounding the ball up at the same time preparing to throw the best strike to the plate that night. A cannon from left field sealed the late victory, as Craig Kimbrel came in the game in the ninth to shut the door. The Red Sox will take on the Royals in a four game series that has gotten underway tonight.